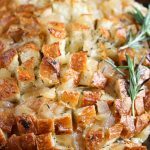 This apple Brie pull apart bread post is sponsored by Joan Of Arc Cheese but the content and opinions expressed here are my own. I remember when I had Brie cheese for the very first time and fell in love with it. 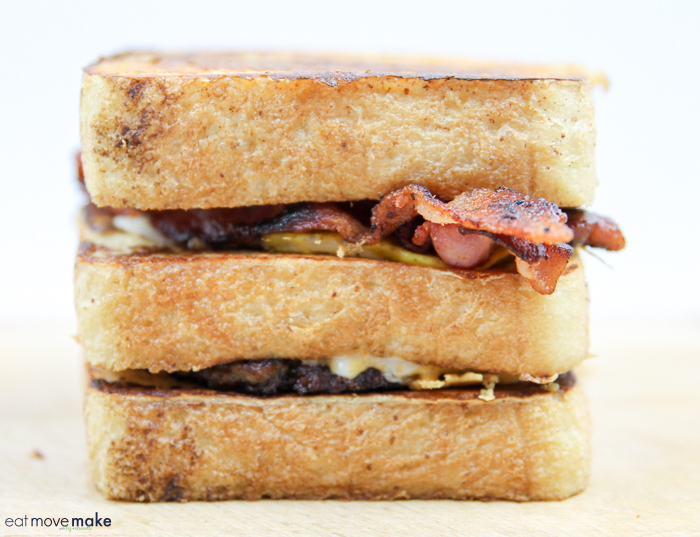 I was in Chicago, it was freezing and I wanted (NEEDED) a feel-good grilled cheese sandwich. Brie was the star of my grilled cheese sandwich parade, and it was so delightfully melty, buttery and ooey, gooey I couldn’t stop talking about it. It began a love affair for life in which Brie now plays a starring role. 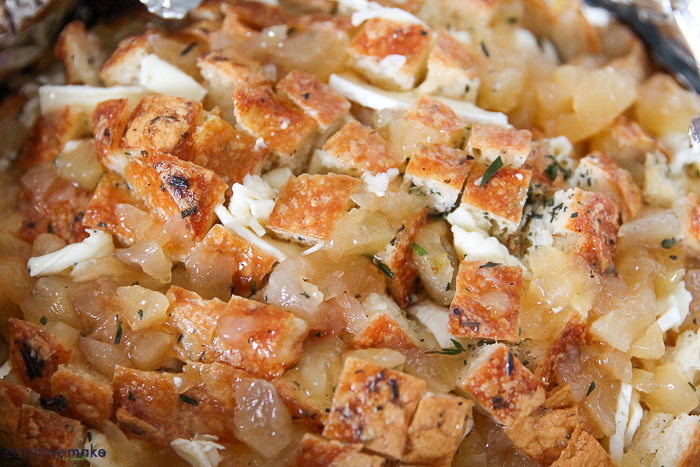 One of my favorite recipes with Brie is this delicious apple Brie pull apart bread. I love to serve it at the holidays. It makes me want to sing, it’s so good. So, to make the apple brie pull apart bread, take a round loaf of bread and cut cross-hatches over the entire surface making sure not to cut all the way through to the bottom. Next cut a wheel of Brie cheese into thin strips. The rind is edible, so you don’t need to remove it, but it doesn’t melt like the actual cheese does, so some people prefer to cut it off. I’ll leave that up to you. 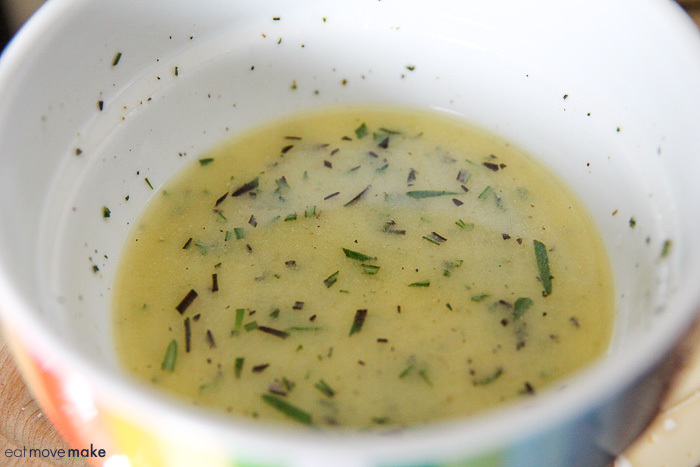 Now melt some butter and stir in some freshly chopped rosemary and thyme. Baste the bread with the melted butter mixture making sure it gets down into all the nooks and crannies you cut. Then it’s time to stuff the bread with all those delicious strips of Brie cheese along with spoonfuls of apple pie filling. 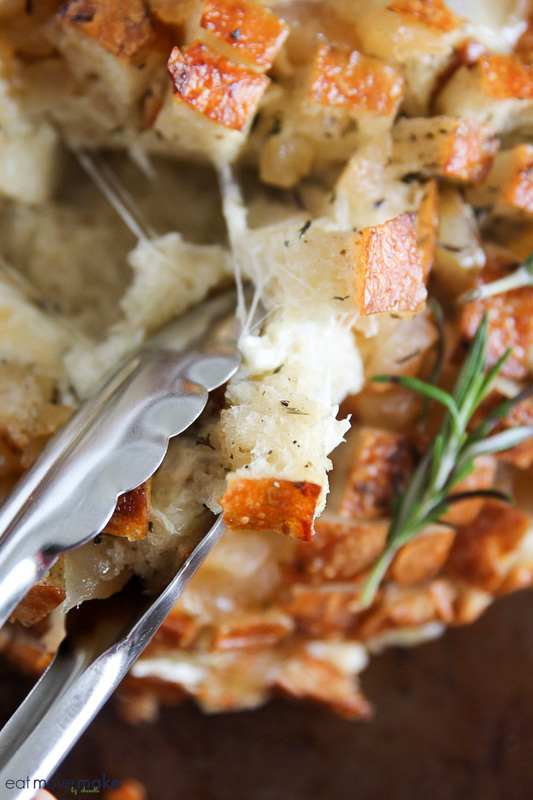 Use all the cheese; you’ll thank me later! I am “brie-cause” I know what it tastes like! Wrap the whole shebang up in aluminum foil and bake it on a cookie sheet. Bake in the oven for 20-30 minutes until cheese is melted and bread is toasty hot. 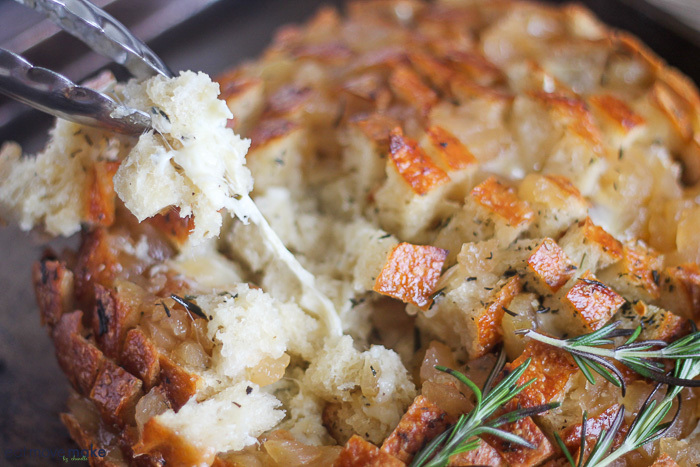 And grab chunks of that delicious cheesy, buttery bread. 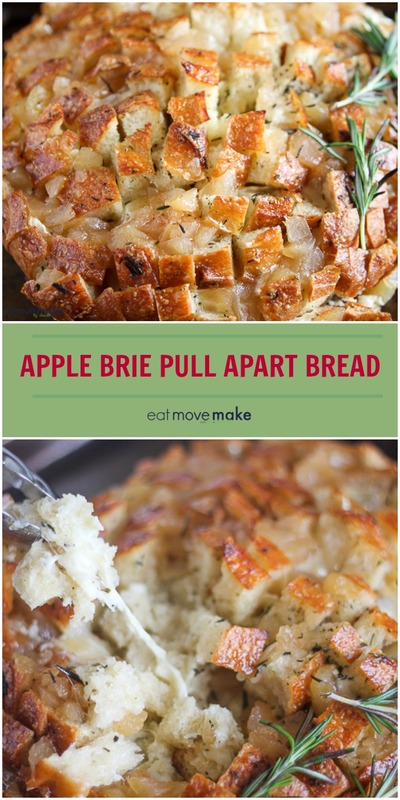 Pin the apple Brie pull apart bread recipe for later! 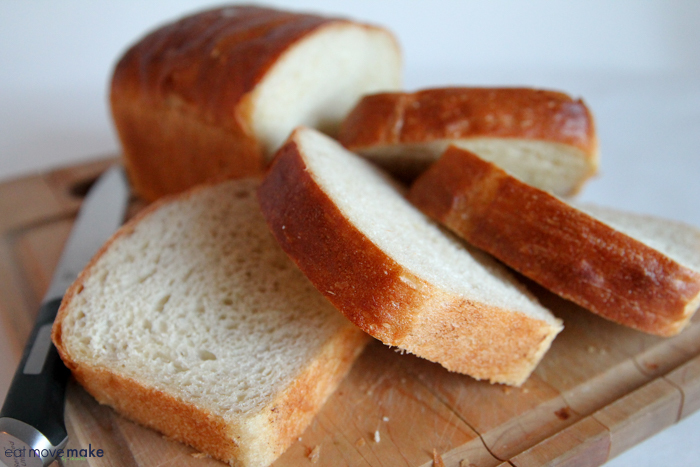 With a serrated knife, crosshatch the bread loaf making deep cuts about an inch apart on the entire surface but not all the way through the bottom. 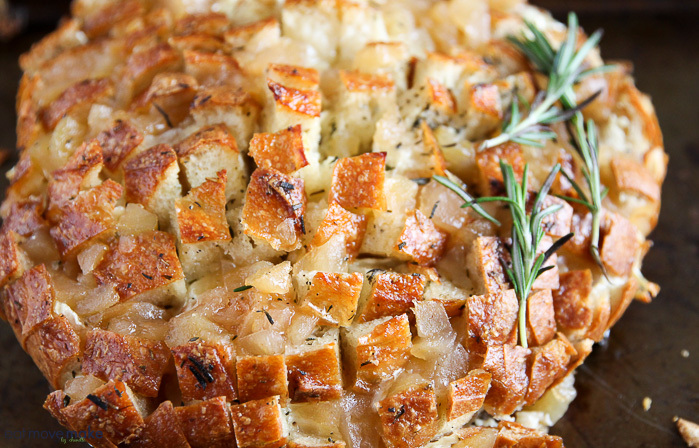 In a small bowl, whisk together melted butter, thyme, and rosemary, Use a pastry brush to apply the butter thoroughly coating the top and inside the bread cuts. Stuff each cut with Brie and apple pie filling, pushing them down inside. 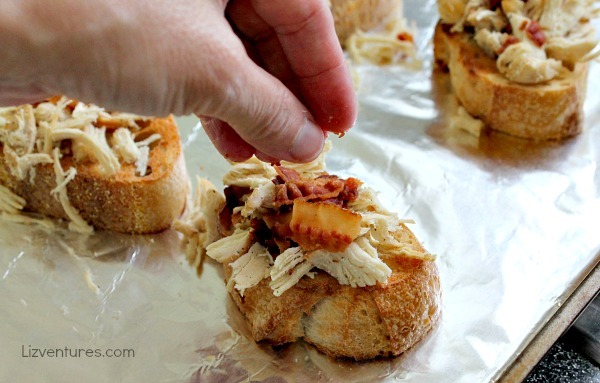 Wrap the loaf in aluminum foil and place on a baking sheet. 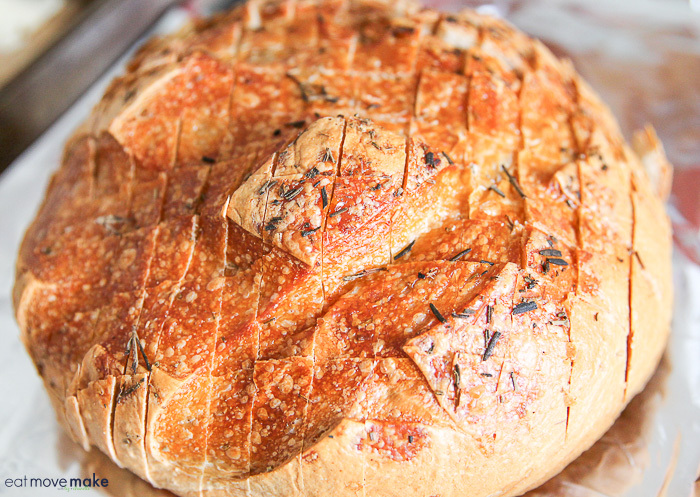 Bake 20-30 minutes or until cheese is melted and bread is toasted and hot. 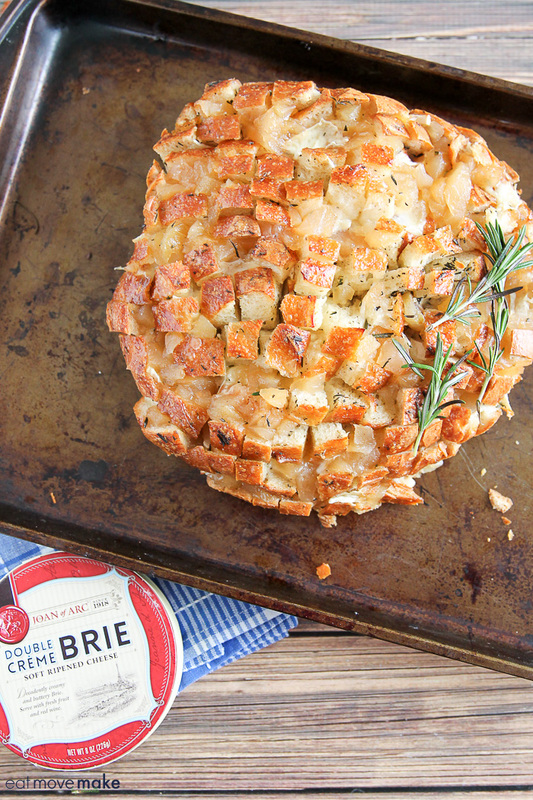 Click here to find Joan of Arc Brie cheese so you can make your own apple Brie pull apart bread for holiday entertaining. 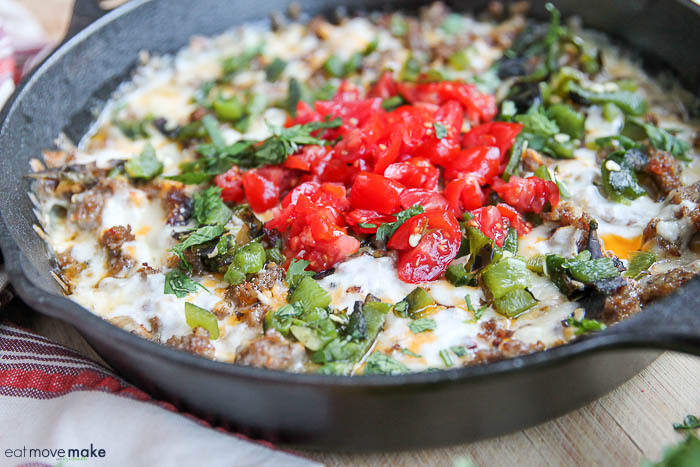 his Queso Fundido recipe post is sponsored by Real California Milk but the content and opinions expressed here are my own. The best part of the holidays is being with the people I love the most, but my food traditions are a close runner-up. 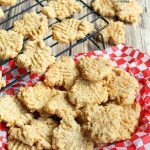 Between the taste of those favorite recipes and the memories that go along with them, it just wouldn’t be the holidays if they didn’t make an appearance year in, year out. Christmas dinner with my family, for instance, doesn’t include a turkey, ham or roast beef. We skip the big dinner and serve appetizers instead… lots and lots of appetizers. 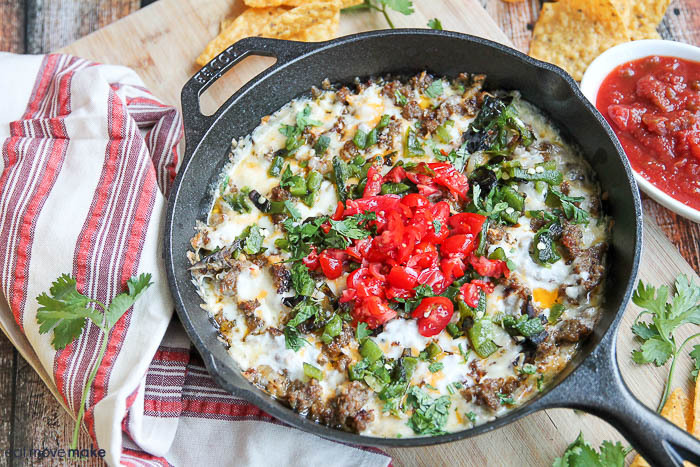 One of our favorites is queso fundido, an ooey gooey cheese dip with sausage or chorizo. If I didn’t make this every year, there’d be a huge uproar and I’d probably be fired from the family. 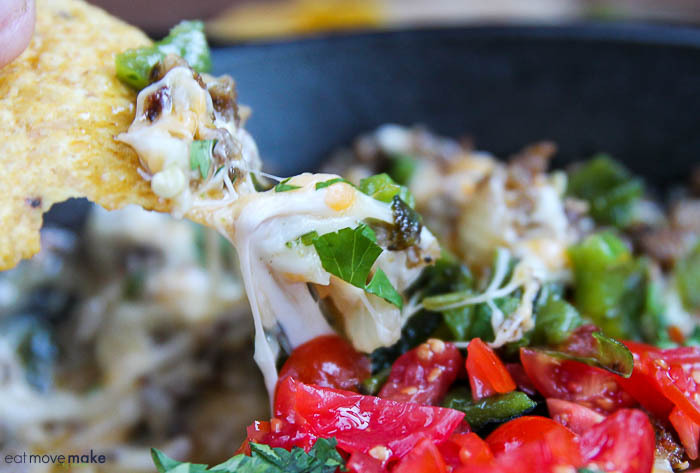 The key to a great Queso Fundido is the cheese. Look for California specialty and Hispanic-style cheeses with the Real California Milk seal on the package. That’s how you ensure you’re bringing something special to the holiday table. California Dairy means real food from real people — 99% of California dairies are family-owned, so elevate your holiday entertaining this year with wholesome, flavorful California cheeses. I use four different kinds of cheese for mine: Queso Blanco, Oaxaca, Sharp Cheddar and Pepper Jack and I buy it in blocks so that I can grate it fresh myself. First I broil a couple of poblano peppers in the oven until they blister and blacken. Once they’re cool, I chop them up, and I don’t worry about the seeds. I also saute some onion and then cook either a spicy breakfast sausage or chorizo until it’s browned and crumbly. Either type of sausage will work fine, so go with your fave. I tend to switch it up all the time. Then I layer the cheese and sausage a few times, sprinkle with the roasted peppers and bake it until the cheese is melted and bubbly. Sprinkle on some freshly chopped tomatoes and cilantro, grab a tortilla chip (or ten) and dig in! 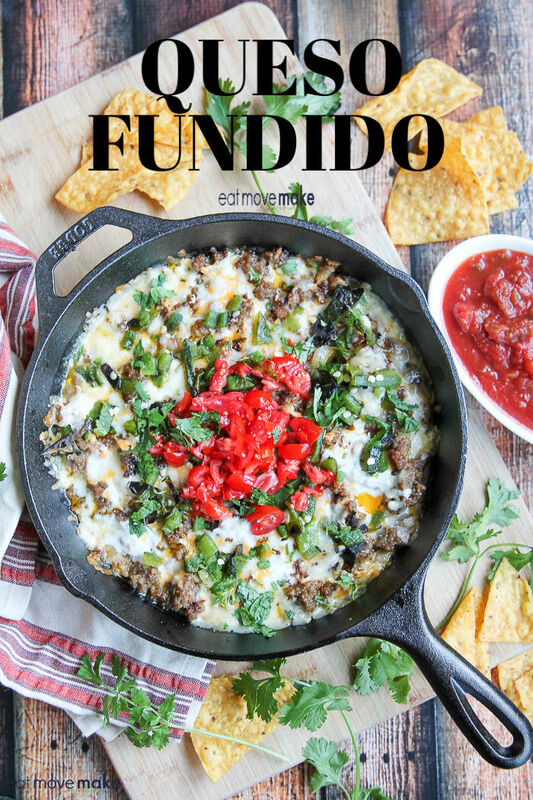 I hope you love Queso Fundido for the holidays as much as me and my family do. It’s so darn good. 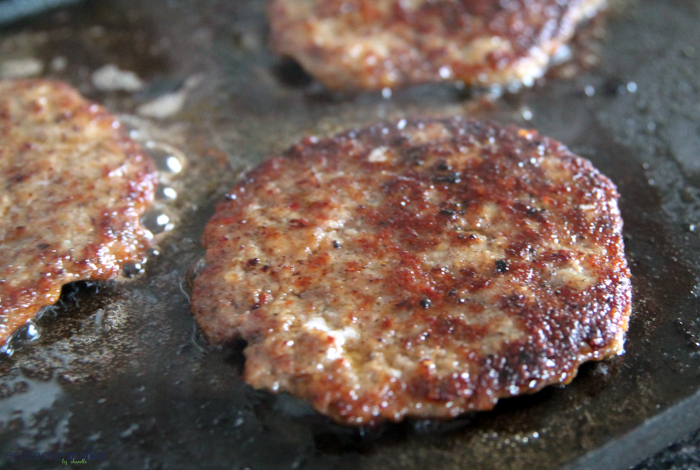 In medium skillet, cook sausage until brown all the way through, crumbling it as it cooks. 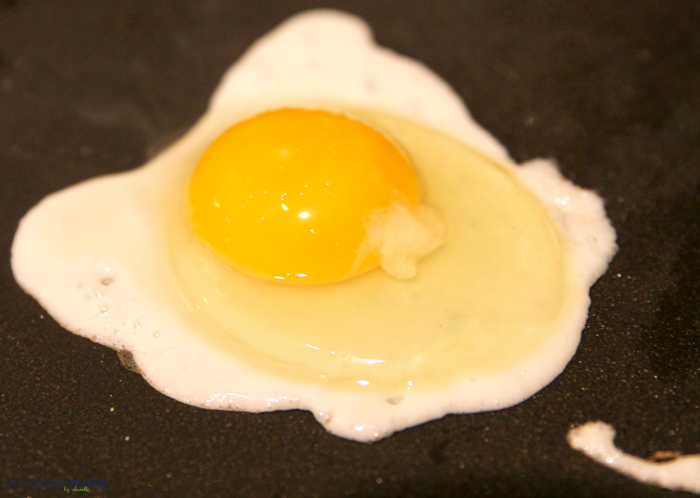 Remove to paper towel to drain off excess grease. Discard all but a tablespoon or two of the grease remaining in skillet. Cook onion until soft and translucent. 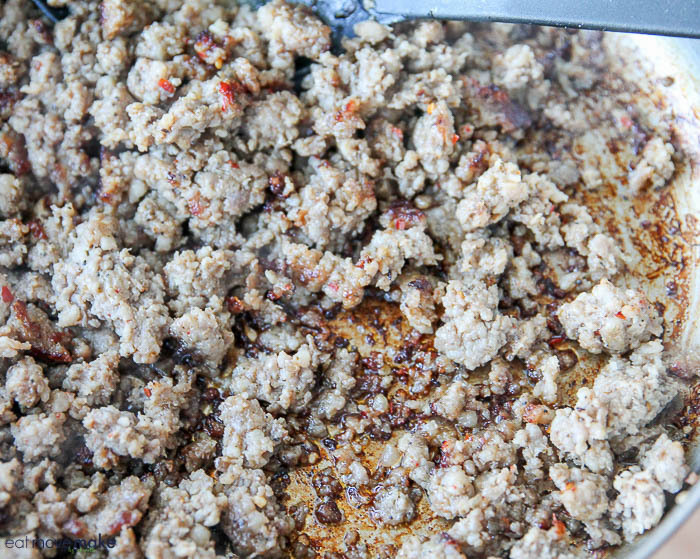 Add sausage to skillet and mix together. Set aside. Turn on oven broiler. 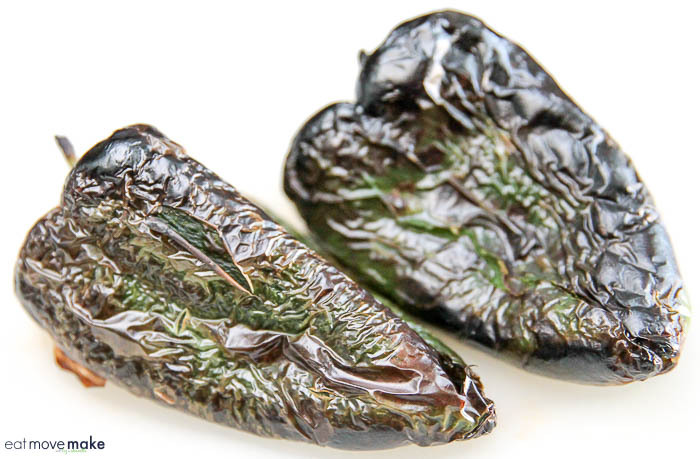 Place poblano peppers on cookie sheet and put under broiler for about 5 minutes or until black and blistered. Let cool, then dice. Turn oven to bake and 400 degrees. Divide the cheese into thirds and the sausage in half. In an 8 or 9-inch cast iron skillet, layer 1/3 of the cheese, 1/2 the sausage. Repeat and top with the remaining cheese. 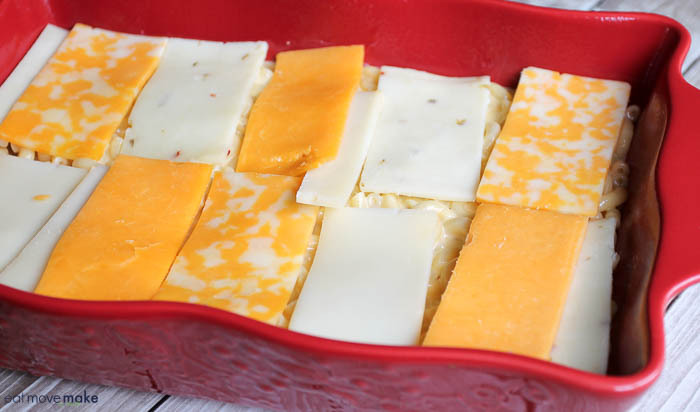 Bake in oven 4-5 minutes or until cheese is melted and starting to bubble. Keep an eye on it! Remove from oven before the cheese starts to brown. 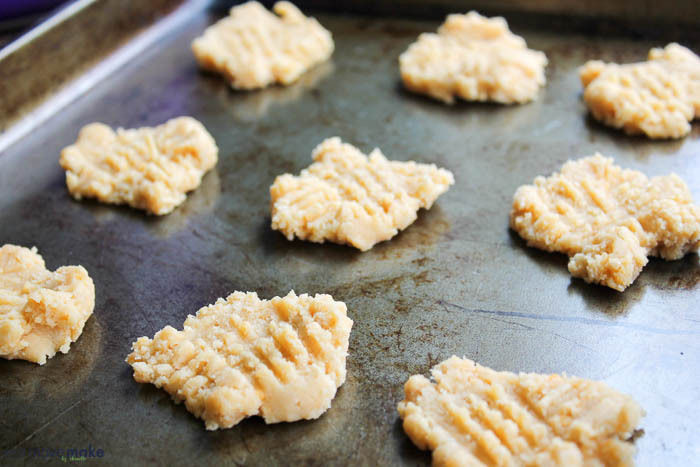 Immediately after removing from oven, fold in 1/4 cup milk and stir gently until cheese is blended and smooth. You want to do this quickly. Top with chopped peppers, diced tomatoes and cilantro. Serve immediately with tortilla chips for dipping. 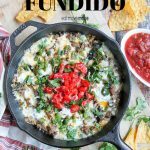 Pin the Queso Fundido recipe! 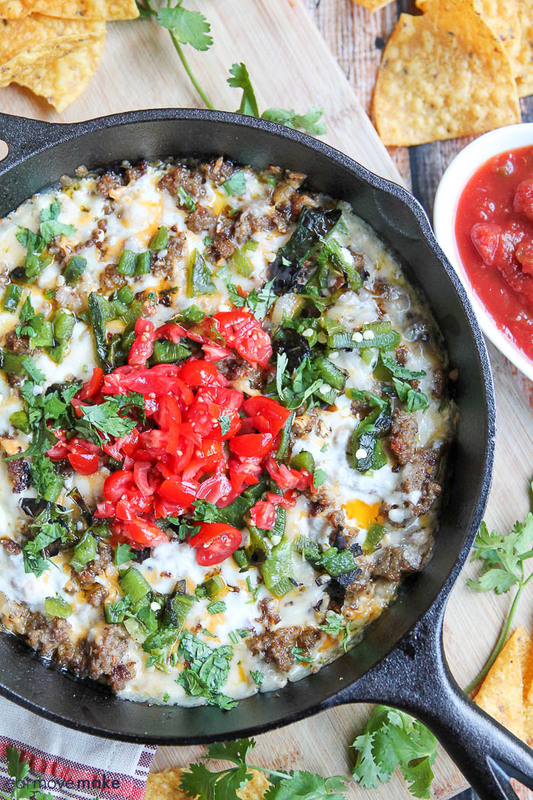 Find a retailer near you selling Real California Milk cheese and bake up a skillet of Queso Fundido to add extra fun and flavor to your holiday menu this year. 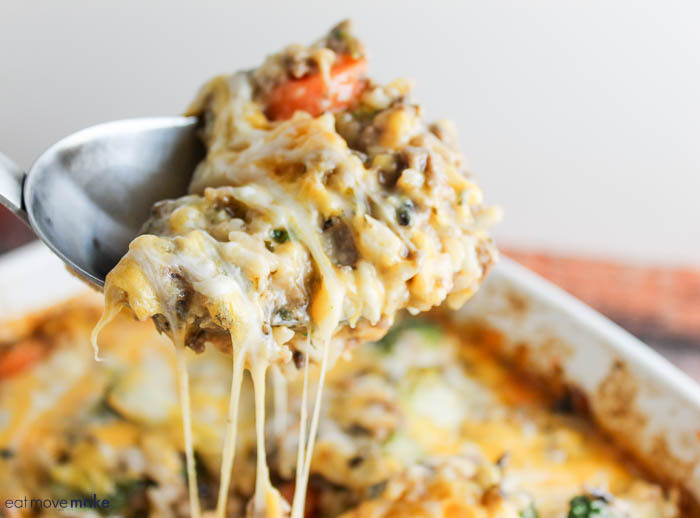 This cheesy beef and wild rice casserole hits the spot every time. 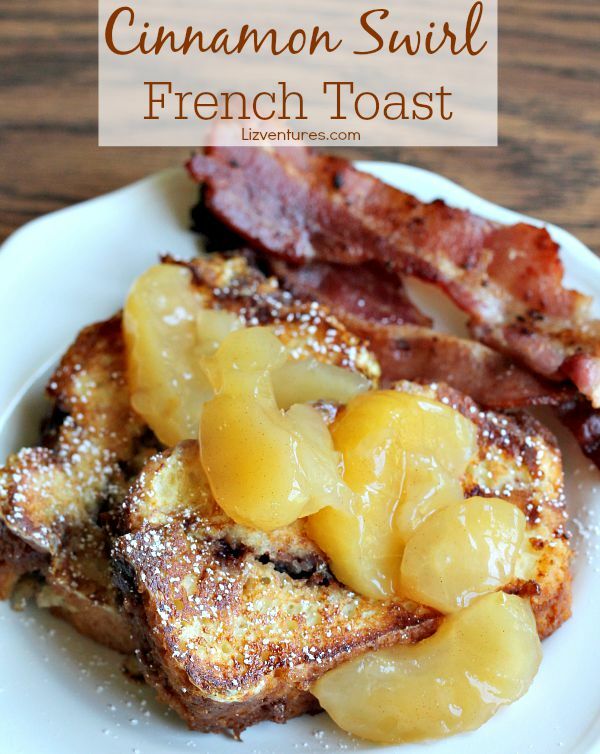 I especially love making it on rainy days when I’m feeling blech and want something warm and comforting in my belly. 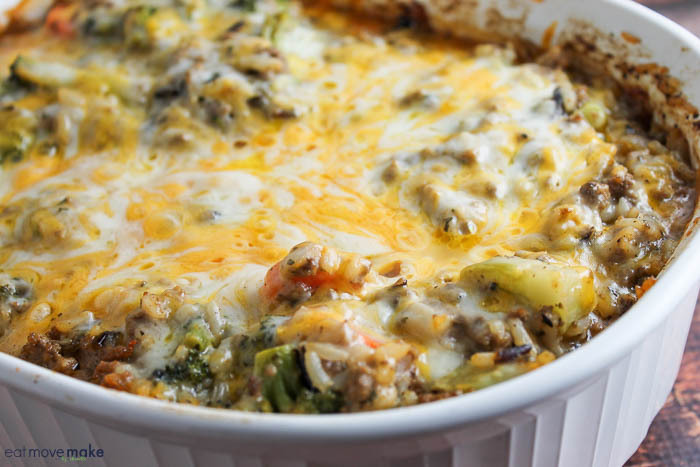 There’s lots of cheese in this dish, but there are also lots of vegetables and rice. It’s all about balance, right? To switch things up, I’ve also made it with ground white meat turkey and that tastes equally delicious. You could also try different veggie combinations or a single veggie if that’s your preference. 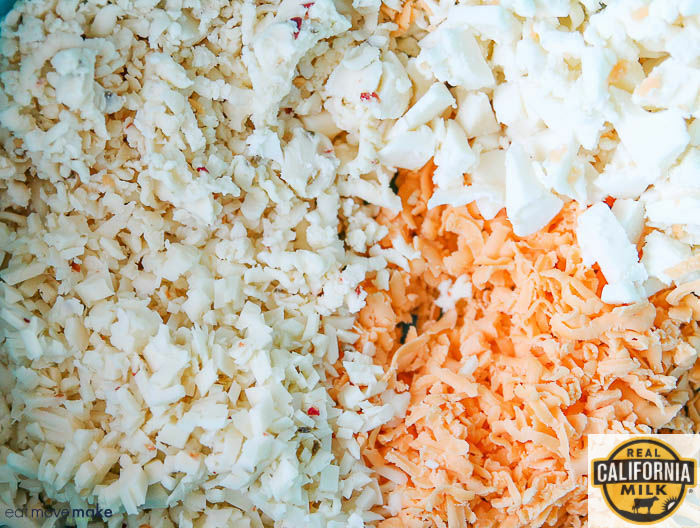 The fun in making casseroles is playing around with the ingredients. I think that’s why I like casseroles so much… well, that and the fact they are seriously good comfort food. But let’s be honest… the cheese is the best part. Perhaps that’s the most comforting part of all. Preheat oven to 350 degrees. In large skillet, brown ground beef and onion; drain. While ground beef is cooking, prepare wild rice as directed on box. 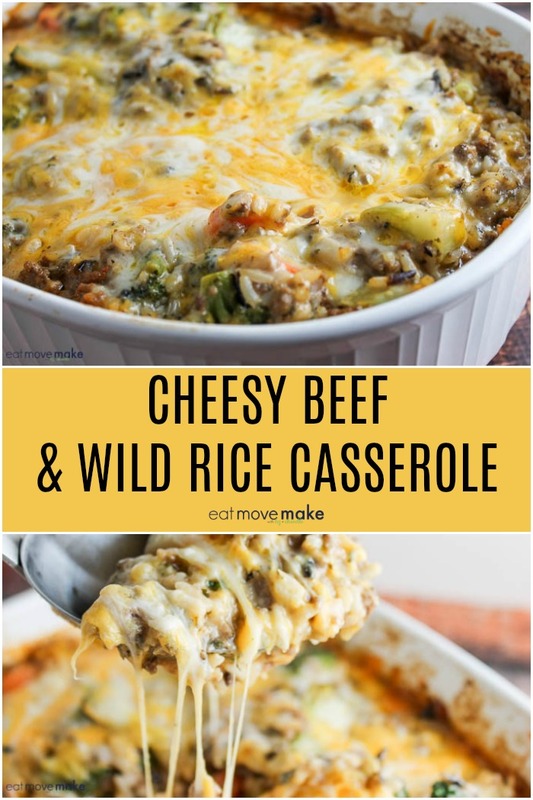 Add cooked beef, vegetables, prepared rice, cream of celery soup, tomato sauce, 1 cup of the cheese, salt, pepper and seasoning to a large casserole dish. Sprinkle on remaining cheese. Cover; bake 30 minutes or until heated through. Pin it for a future meal! 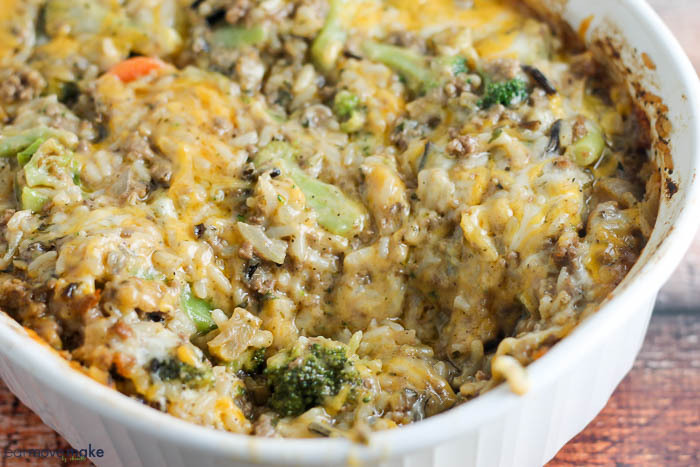 Casseroles are my jam, and this cheesy beef and wild rice casserole is delish! 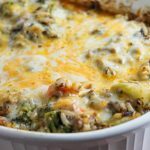 I have a ton of other casserole recipes on the blog too, so check them out for more dinner inspiration. 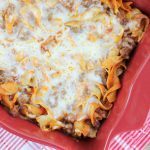 This pizza casserole recipe brings classic pizza flavor to pasta in this cheesy and delicious baked hot noodle dish. You can’t go wrong with melted cheese on anything, as far as I’m concerned. 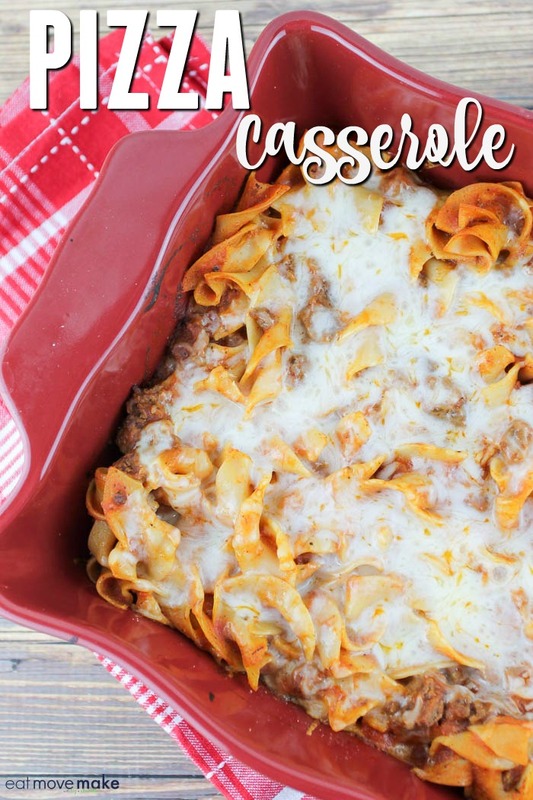 I remember my mom used to make this pizza casserole when she had “company” over, so she called it a “company casserole”. We kids were served TV dinners in the kitchen (remember the TV dinners with foil trays?) while the guests got to eat things like this pizza casserole. And her scrumptious desserts. The only time we got to have any was when her guests were all finished eating and she’d bring the nearly empty dishes back into the kitchen. Then we’d all grab forks and dig into whatever we could get! 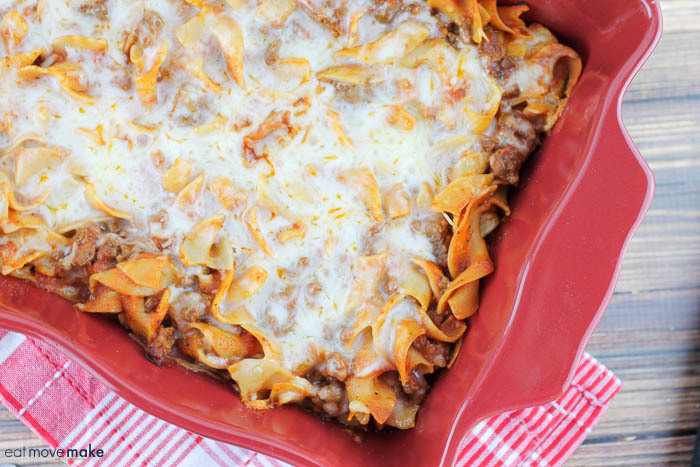 Just like with pizza, you can customize pizza casserole to taste. Keep it stripped down to basics with cheese, sauce, meat and noodles or toss in all the other pizza toppings you love. Pepperoni, green peppers, mushrooms, sausage, black olives… you name it! Although I really love using extra wide noodles in this, you could easily switch to penne, rotini or any of your favorite noodles. Just choose one that will hold on to the sauce well. 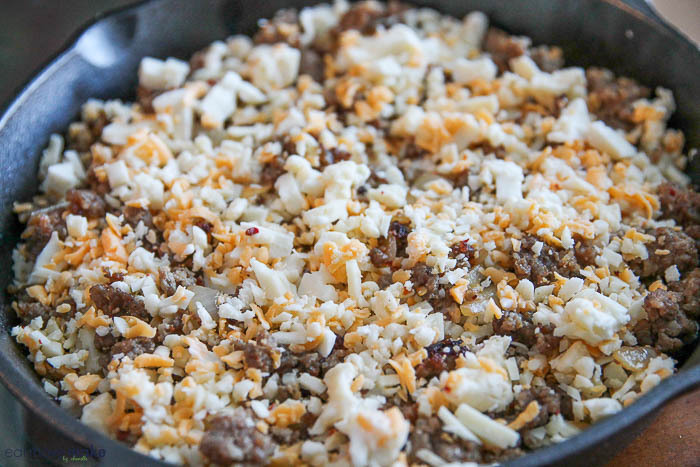 While noodles are cooking, cook ground beef in frying pan. 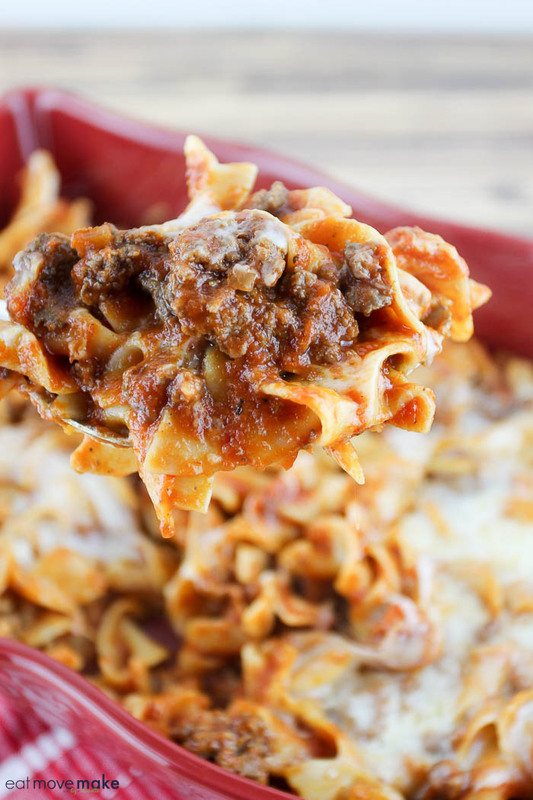 In large bowl, combine noodles, meat and all ingredients EXCEPT cheese. Put half of the mixture in a 9"x13"-inch casserole dish. Sprinkle half of the cheese over top. Repeat with remaining meat mixture and cheese. Cover with foil, and bake 30-40 minutes. 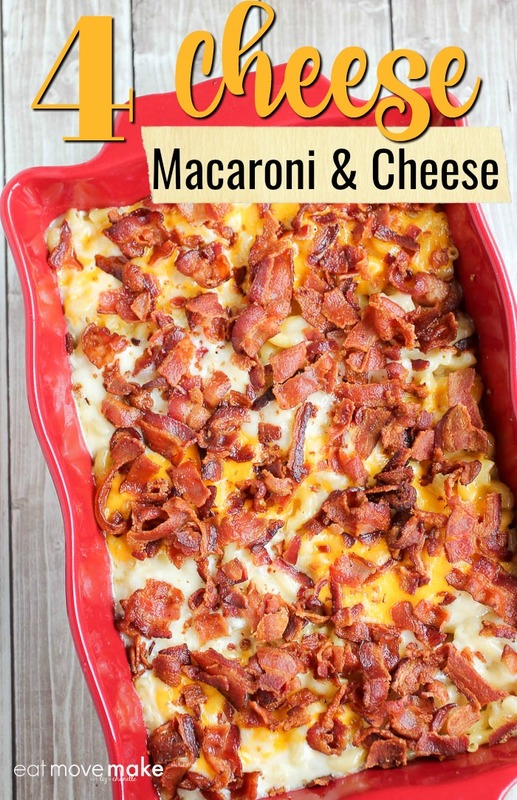 This four cheese macaroni and cheese with bacon is a twist on one of my favorite holiday side dishes. On Thanksgiving we do the traditional turkey and cranberries meal, but on Christmas we have a baked ham and that’s when the ooey gooey comfort of mac and cheese makes an appearance on the holiday table. And this extra cheesy twist on the classic is the best macaroni and cheese I’ve ever had. The best. 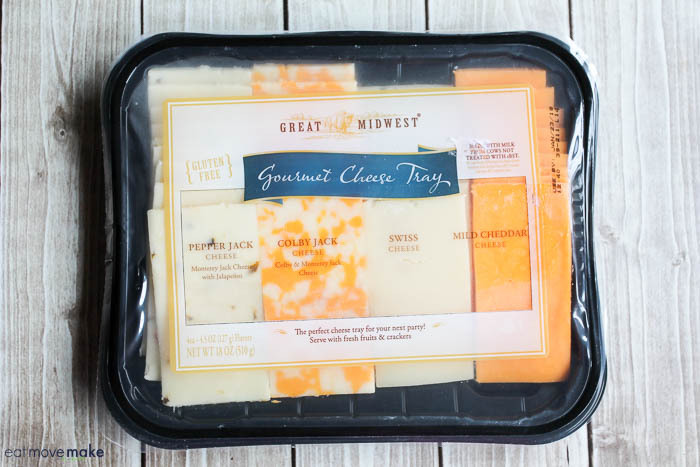 I usually use a combination of two cheeses to make mac and cheese, but when I went grocery shopping, I saw an assortment of four cheese varieties in one package from Great Midwest® Cheeses, and I felt inspired to go cheese-crazy four times over! 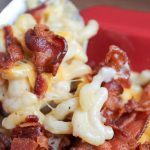 Now technically, it was probably designed for crackers and whatnot, but the varieties and amounts in this particular gourmet cheese tray were perfect for a four-cheese macaroni and cheese with bacon. 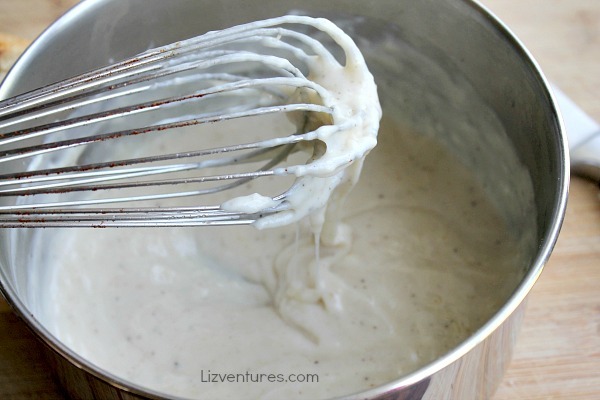 Begin by making a roux, and I promise you it’s easy as long as you whisk, whisk, whisk. You pretty much want to be whisking from start to finish, and it will turn out to be the creamiest, cheesiest most wonderful mac and cheese you’ll ever taste. When the cheese sauce is ready, dump in your pasta and stir to coat. Pour it all in a baking dish and then add more cheese. 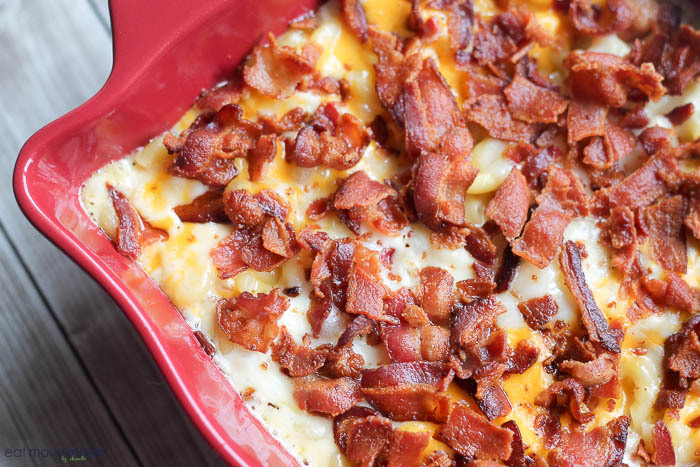 Cover with TONS of crumbled bacon, then bake it for 15 minutes. 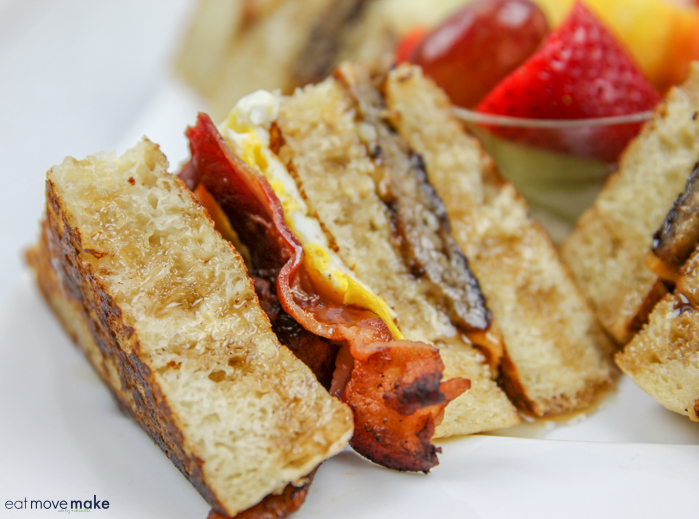 Prepare to fall in love – a bite at a time. 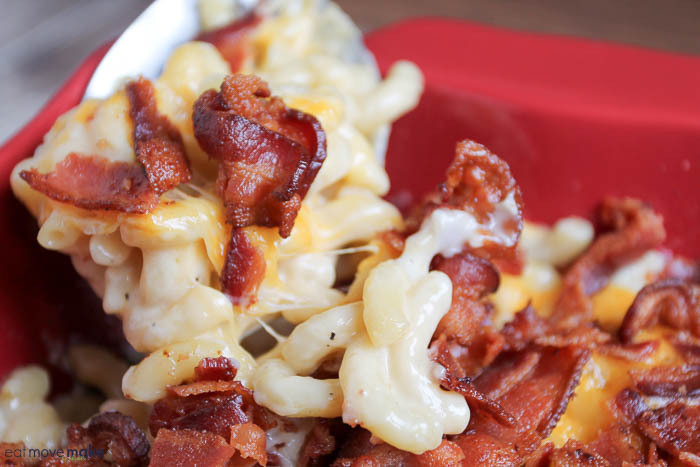 The combination of all four melted kinds of cheese PLUS bacon is ecstasy. Pure ecstasy. Cook pasta according to directions; drain and set aside. In Dutch oven stockpot over medium heat, melt butter. Slowly add flour, continuously whisking. Whisk in chicken broth. Slowly add cream, whisking throughout. 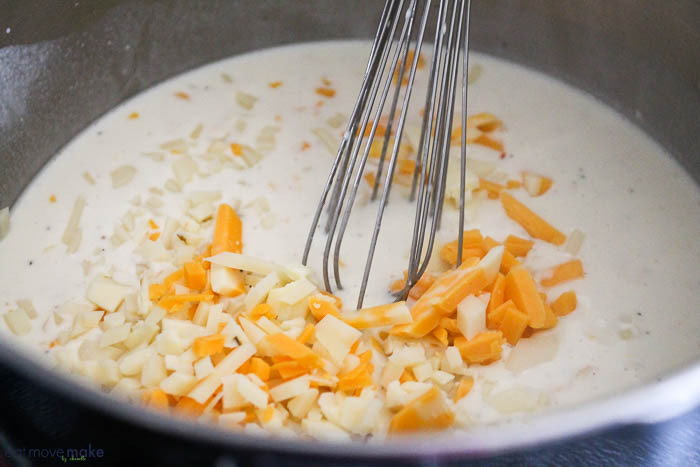 Gradually add 3/4 cup of each of the four cheeses while continuing to whisk until smooth. 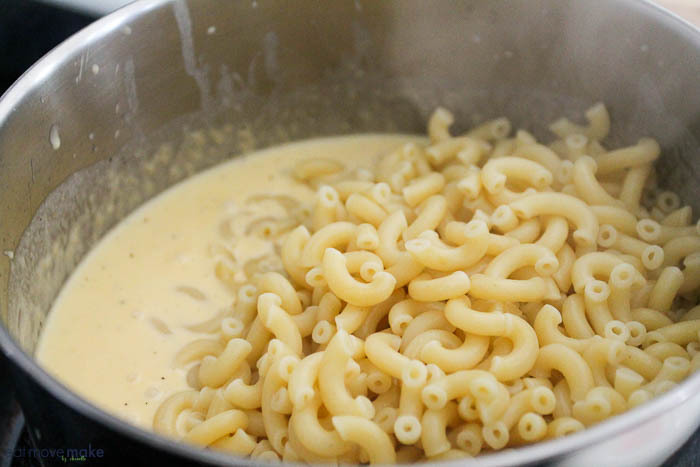 Add pasta to cheese sauce, stirring to mix well. Turn into the casserole dish and spread evenly. Add the remaining cheese on top. Sprinkle crumbled bacon over cheese. 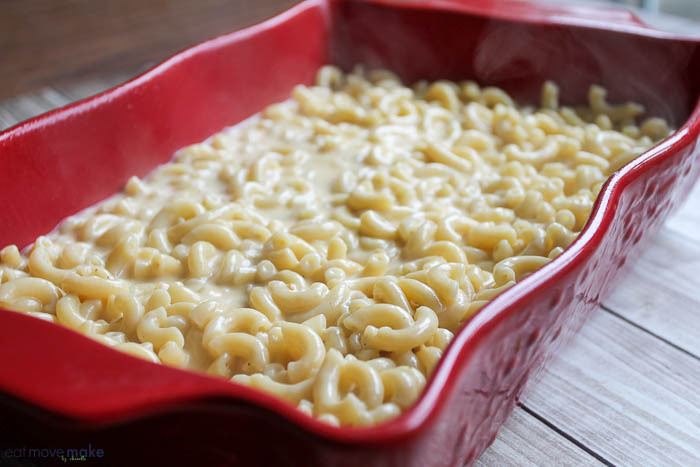 This four-cheese macaroni and cheese is creamy, ooey, gooey magic, I tell ya. 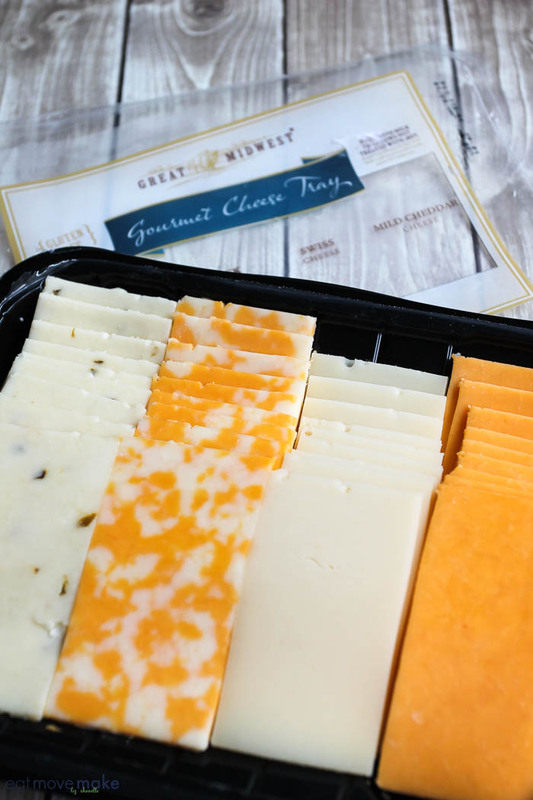 Put a spin on your holiday classic and try all the Great Midwest® flavored Cheddar & Jack Cheeses! 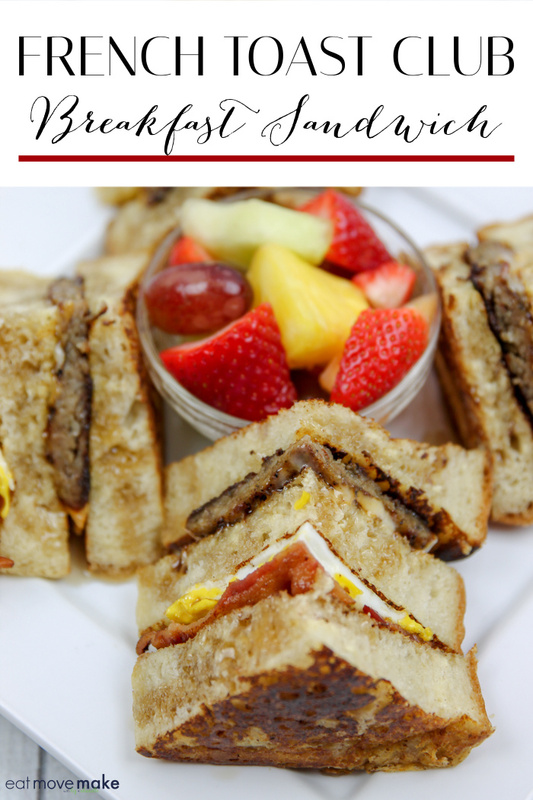 Nothing says comfort food to me like a grilled cheese sandwich does, but I’m a big girl now, and I love grown-up grilled cheese sandwiches with fabulous breads. 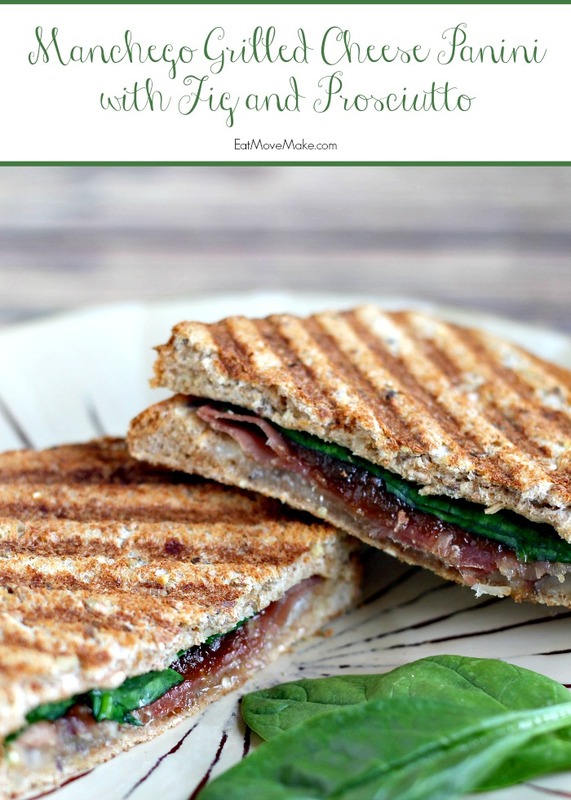 Like this Manchego Grilled Cheese Panini with Fig and Prosciutto. It’s ah-mazing, and the bread I used was everything. 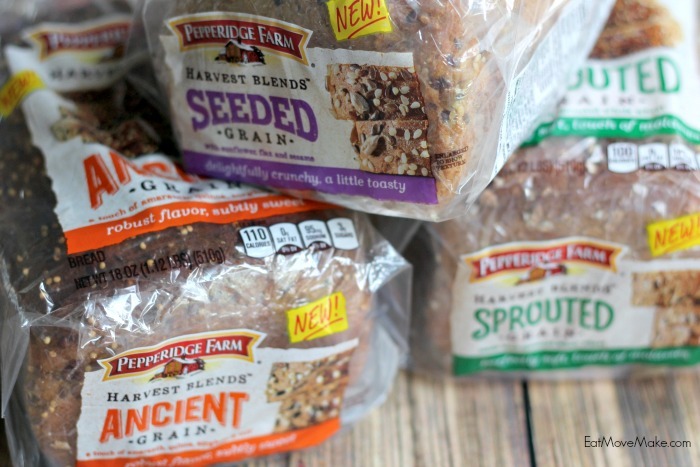 This post is sponsored by Pepperidge Farm in conjunction with Blog Meets Brand and I have been compensated for my participation. All opinions are my own. 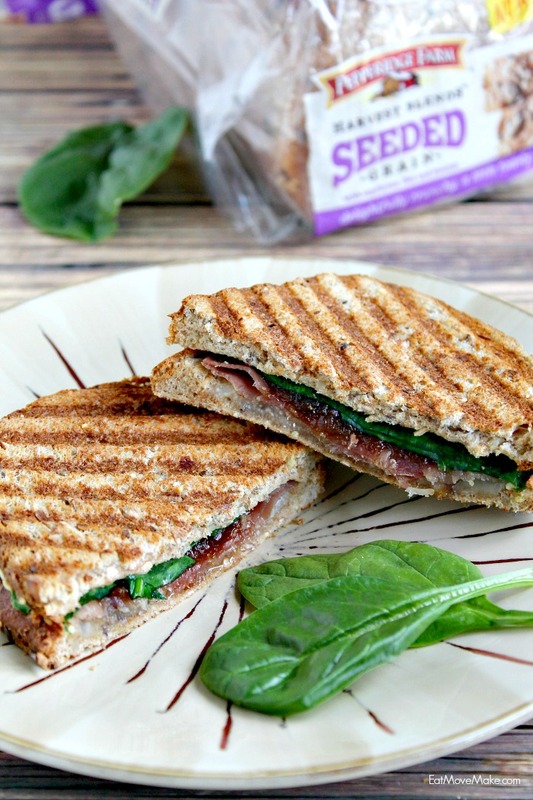 Soooo, to make the Manchego grilled cheese panini with fig and prosciutto, you’ll need Harvest Blends Seeded Grain bread, fig preserves, baby spinach, prosciutto and Manchego cheese. 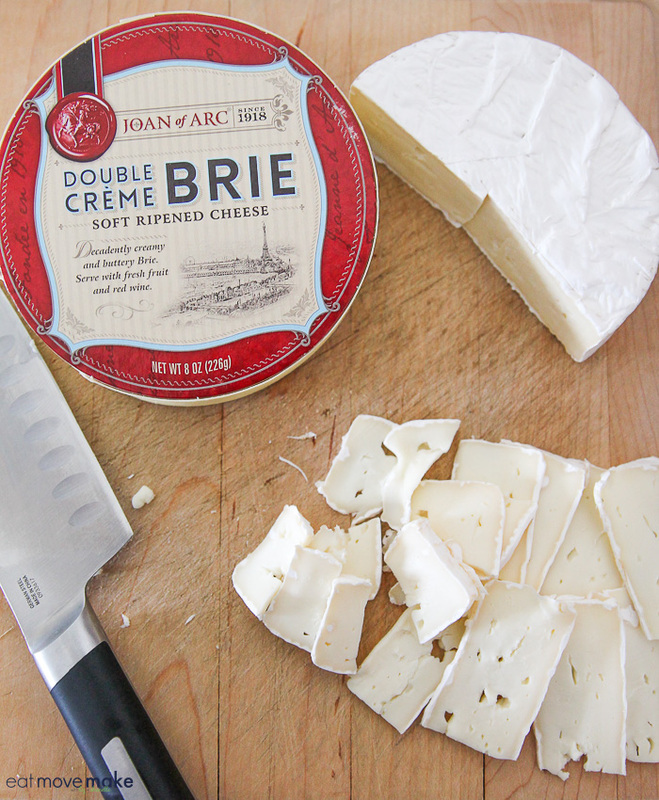 If you can’t find Manchego cheese, you can substitute a very sharp white English cheddar. 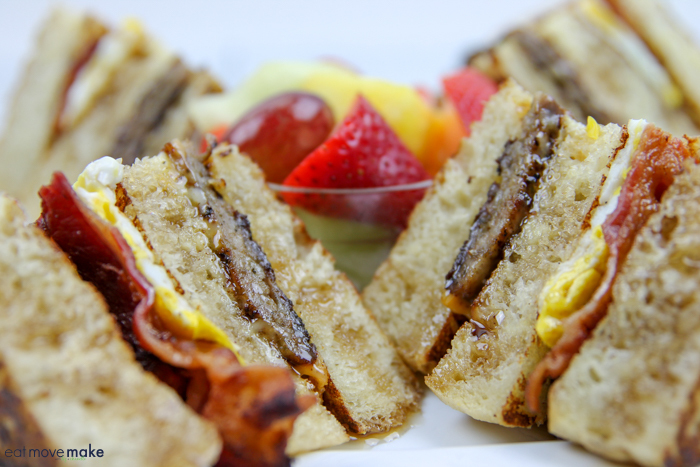 The sharp flavor of the cheese is the perfect counterpoint to the sweetness in the fig preserves. 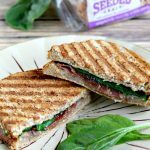 The ingredients all work together to tickle the palate with a balanced flavor profile, so if you’ve never tried this combination of ingredients in a sandwich before, you may be surprised by how much you like it! 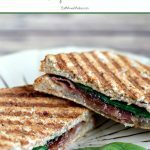 There are only five ingredients in this panini, so you’ll have it ready for the panini press (here’s the one I use) in no time. 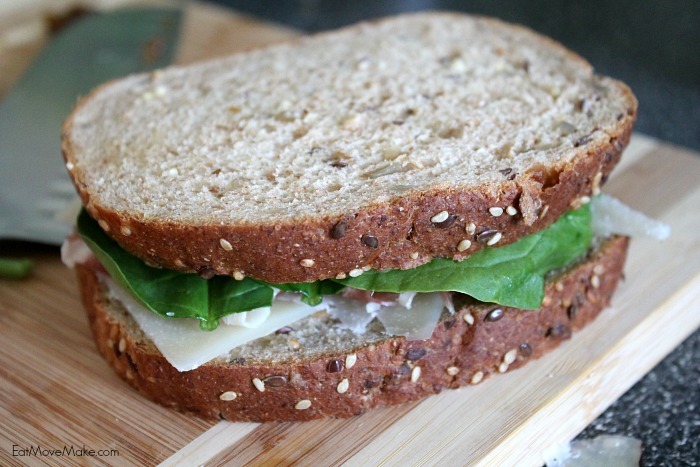 This sammy is ready for the panini press! If you don’t have a panini press, you can use a cast-iron fry pan to press it or you can just make it traditional grilled cheese sandwich-style. 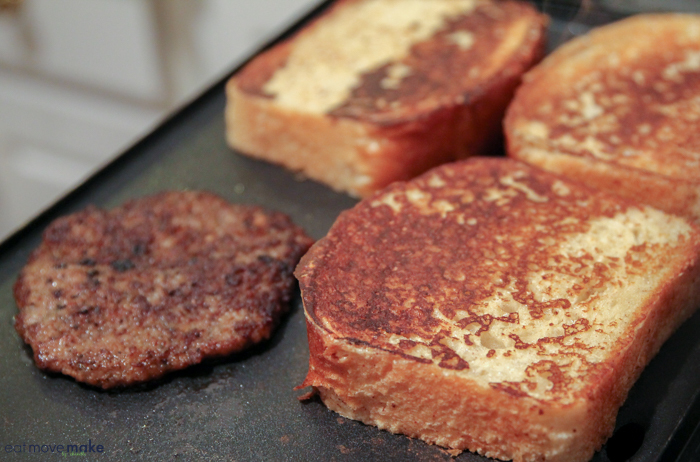 I like paninis because I don’t have to use any butter on the bread, but I still get those appetizing grill marks on the sandwich. 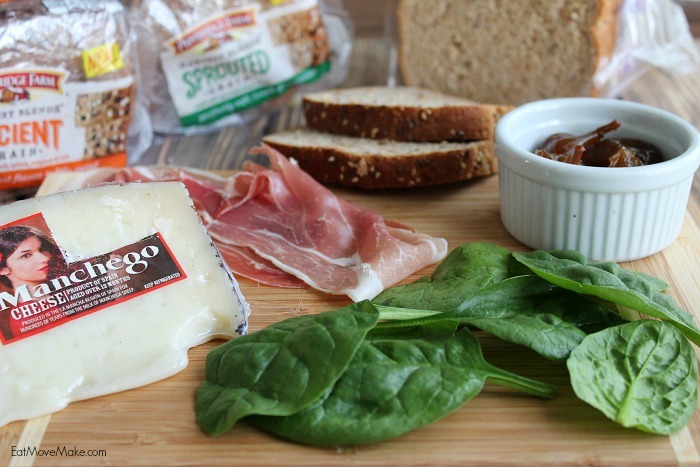 On one slice of bread, layer prosciutto, Manchego cheese, fig preserves and spinach. Cover with remaining piece of bread. Preheat panini press according to manufacturer directions. Place sandwich on panini press, close lid and heat for 4 minutes. Serve immediately. 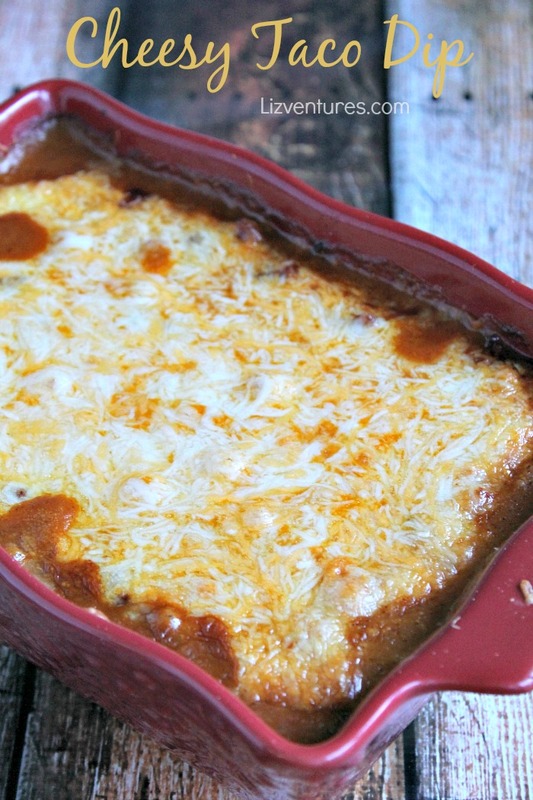 This Cheesy Taco Dip is so tasty and flavorful! 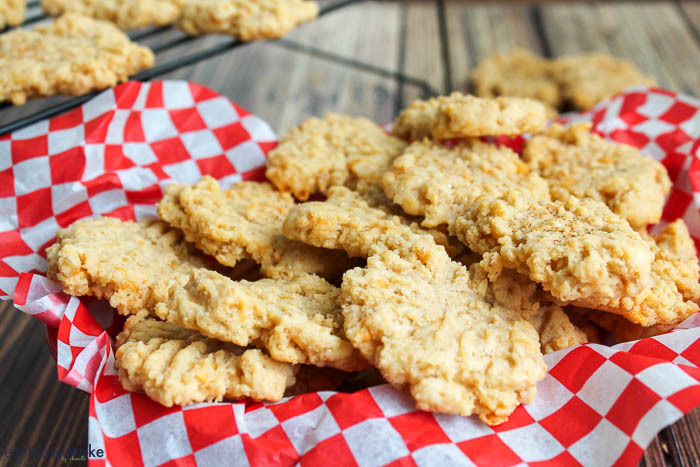 It’s definitely a winning game day recipe. 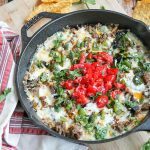 Served hot and gooey with lots of melted cheese, it’s a touchdown perfect addition to a fabulous game day menu. Sponsored by Family Dollar. Recipe and opinions are my own. Everything needed to make the cheesy taco dip can be found at Family Dollar, and you know what that means?! It’s very budget-friendly! Entertaining can be an expensive undertaking, but with affordable ingredients, you can not only entertain, but do it with a “wow”! 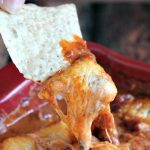 I’ve shared this recipe on the Family Dollar blog too, so you’ll want to head over there to see exactly what I used to make this layered cheesy taco dip deliciousness. Heat oven to 350 degrees. Spray a small rectangular baking dish (7 1/2" x 5 1/2") with cooking spray. In small bowl, add chili powder to Rotel tomatoes and stir in. Set aside. 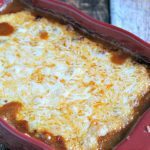 Spread half of the refried beans into the bottom of the baking dish, then add layers of the following ingredients: half a can of chili, 1/2 cup cheese, 1/4 cup diced jalapenos, half of the tomato mixture, and 1/2 cup salsa con queso. Then add remaining refried beans, chili and tomatoes. Cover with foil. Bake 45 minutes. Uncover; sprinkle remaining 1 1/2 cups cheese over the top. Bake uncovered for an additional 15 minutes, until cheese is melted. 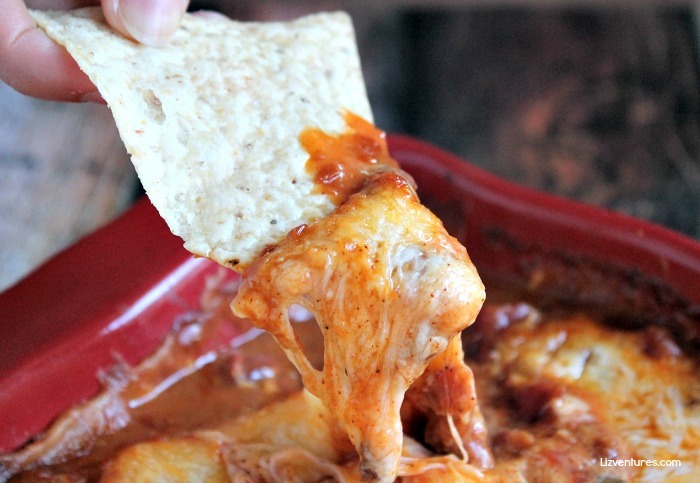 Serve with Tostitos for dipping. 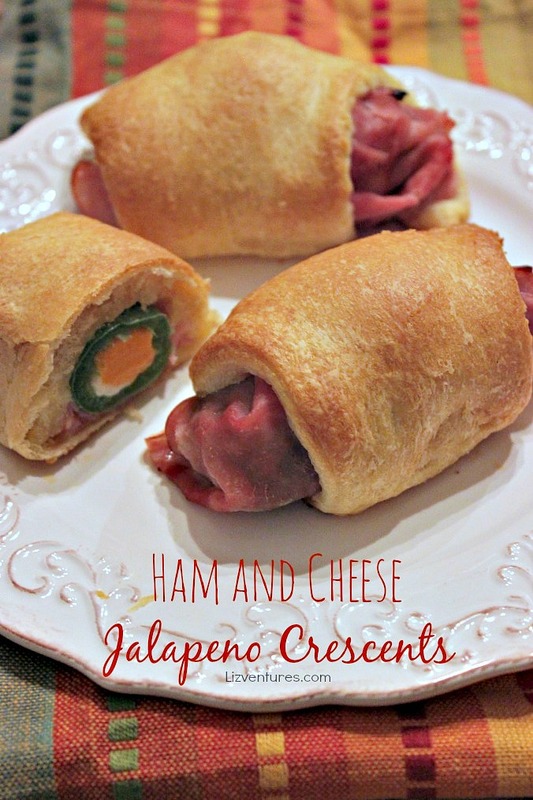 Ham and cheese jalapeno crescents! 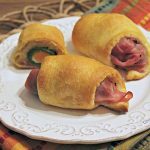 The classic and well-loved combination of ham and cheese gets a twist of jalapeno heat before being rolled up and baked in a hot and flaky crescent dough blanket. 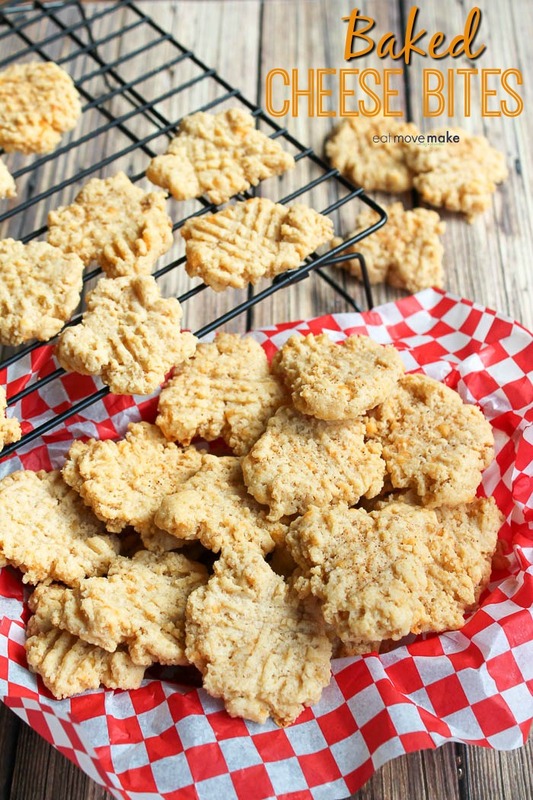 Created with just four ingredients, they make a delicious addition to a dinner menu or a perfect party appetizer. I’ve been enjoying the flavorful smokehouse sausage from Old Wisconsin since I was a little girl. My dad’s clients often gave him sausage and cheese gift baskets, and I distinctly remember the oh so delicious spicy, smoked taste. So you’d think I’d use that in a recipe wouldn’t you? Normally, yes, but there’s an added secret ingredient each month in the Make It Delish contest, and this month’s ingredient is Frigo cheese sticks. 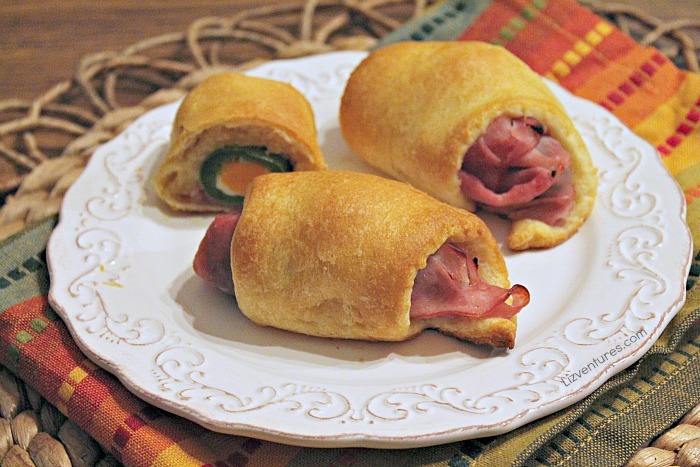 Since I can’t resist the combo of ham and cheese, and Buddig has a delectable smoked honey ham… ham and cheese jalapeno crescents were born. You can watch my video tutorial for a step by step on how I made them. There are only four ingredients, so it’s pretty easy to follow. Start water boiling. While it comes to a boil, prepare the jalapeno peppers by cutting off stem end and scooping out the insides and seeds. Place peppers in steamer basket. Cover and steam over boiling water for 15 minutes. Rinse under cool water; drain. Set aside. Wrap a slice of ham around each end of a pepper. Unroll the sheet of crescent roll dough and separate into triangles. Place the wrapped pepper at the pointy side of the triangle and roll up. Place on ungreased baking sheet. Bake 11-13 minutes or until golden brown. And the results are positively delicious! 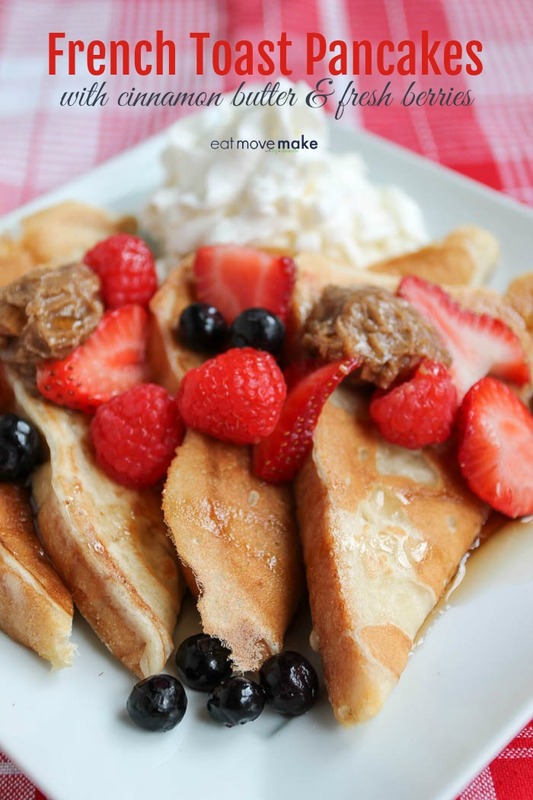 You can enter the Make It Delish contest with as many recipes as you’d like. At the end of October, November and December, judges will choose winners! Not only will the top scorers win prizes, but their recipes will be published in a special digital Buddig cookbook! To enter and for official rules, click here. This post was made possible by iConnect: Influencer Management and Buddig. I was compensated for my time, but all opinions are 100% mine. 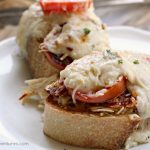 I’ve always wanted to try a Kentucky Hot Brown recipe, so when I stumbled across one on the newly redesigned Food Lion website, I couldn’t resist making it. 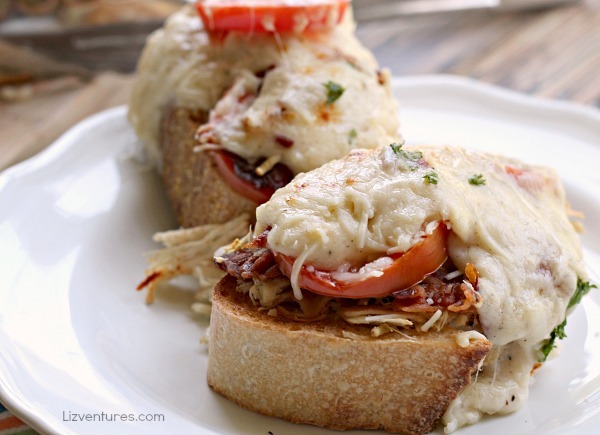 Shredded chicken, crumbled bacon, fresh tomato slices and a creamy Parmesan sauce melted under the broiler and served open-faced on a slice of toasted bread. 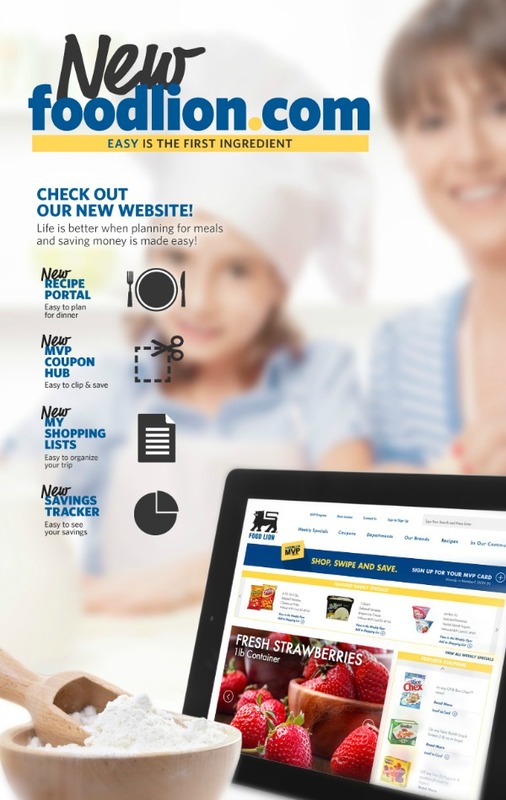 So like I said, I found this tasty idea at FoodLion.com where they have a new recipe portal. Based on what I’ve seen so far, there are oodles of yummy ideas to be found. 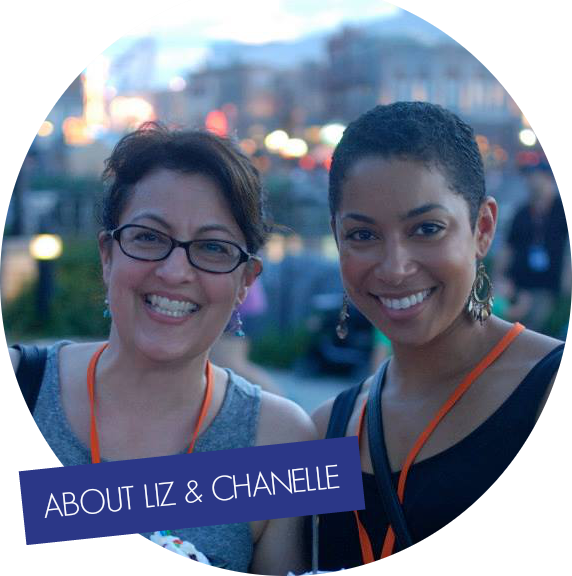 Recipe portal – community driven contributions! MVP coupon hub – add coupons directly to your MVP card. No need to carry paper coupons. Savings tracker – see how much you’re saving! Food Lion makes it so easy to plan and prepare weekly meals. 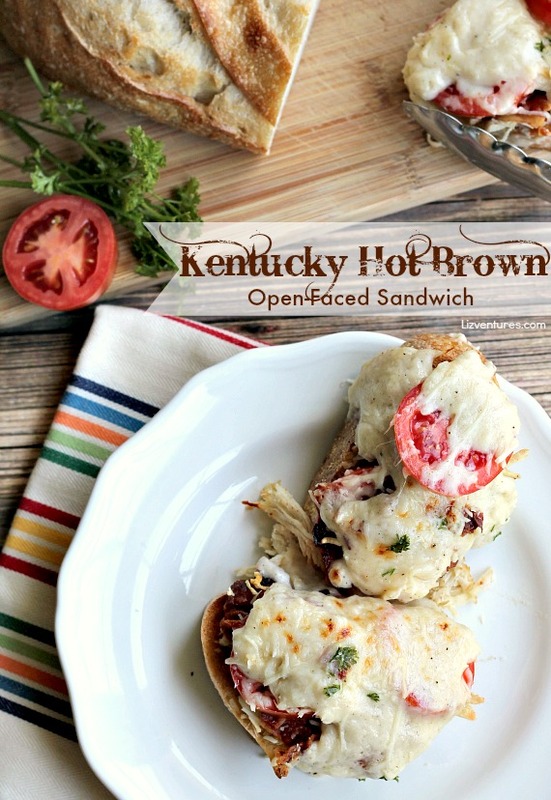 They sure made it easy for me to make this Kentucky Hot Brown recipe! Here’s where I found it. I bought a loaf of crispy bread, cut it into thick slices and then toasted them. I topped those with some shredded chicken and crumbled bacon. Next I spooned some creamy Parmesan cheese sauce over the top. Then I added fresh Roma tomato slices and some shredded Parmesan cheese, and broiled those babies for a few minutes until the cheese was melty and starting to brown. Can I serve you a sandwich? 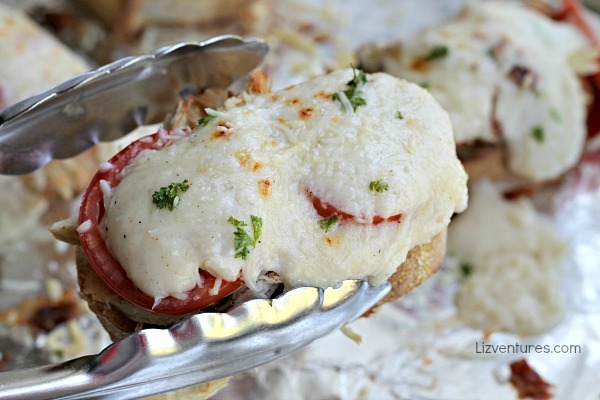 I’m pretty sure you’re going to love this Kentucky Hot Brown recipe! 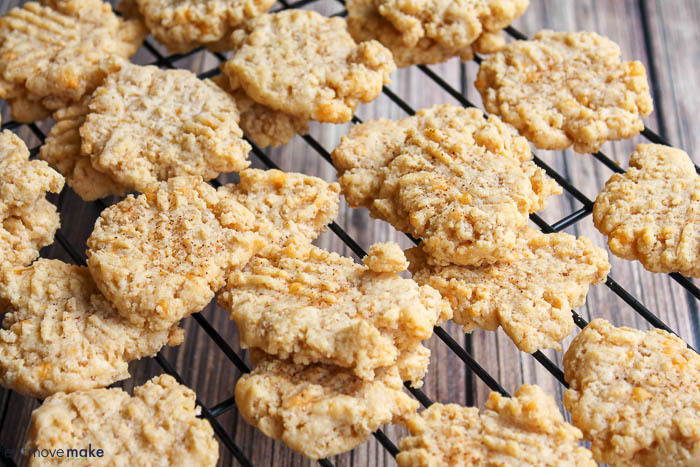 I’m so glad I found it at the new Food Lion recipe portal. 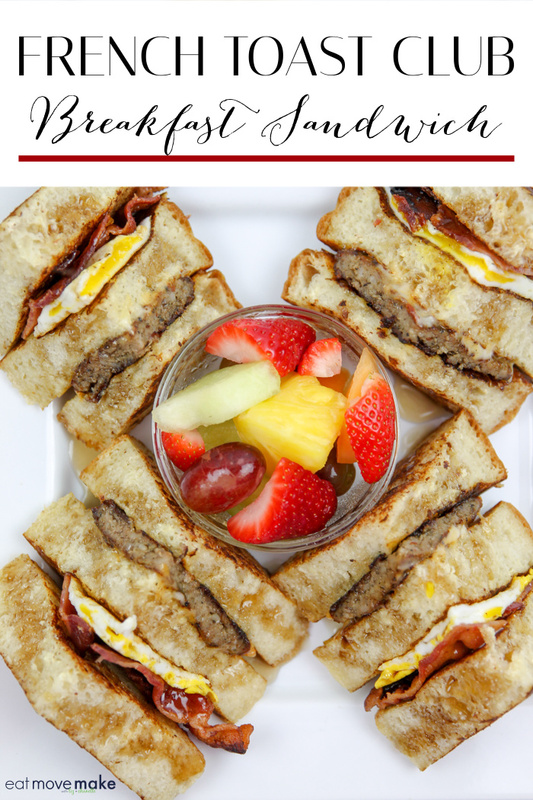 To celebrate the launch of Food Lion’s new website, let’s have a giveaway! 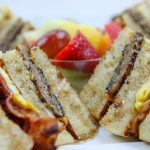 One lucky reader will win a $25 Food Lion Gift Card to help make preparing those summer meals easier! Sponsored by Food Lion. All opinions are my own.